Next-generation Wave 2 may seem the right way to go, but don't leap without doing your due diligence. 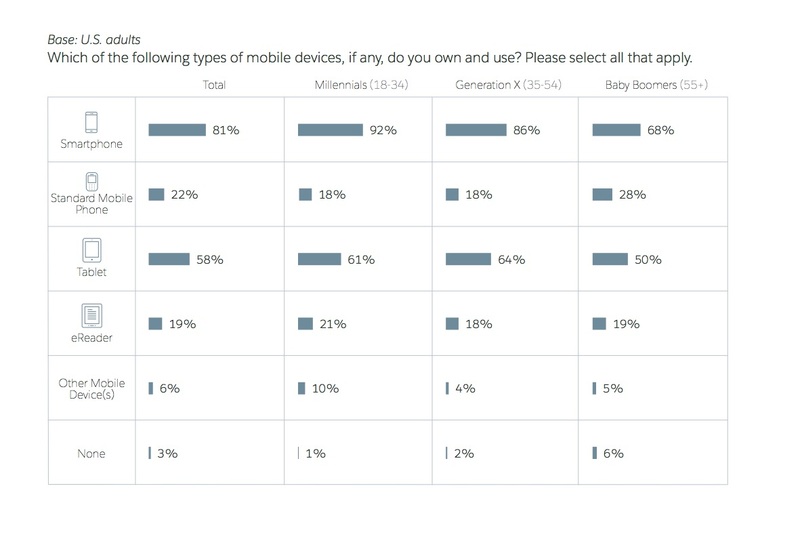 The "2017 Connected Subscriber Report" from Salesforce breaks out generational uses of mobile devices by type, and shows that most respondents have at least two mobile devices: a smartphone and a tablet. In addition, on average, 19% of all users across generations also use an eReader, and six percent of these same people use other mobile devices, as shown below. I got to thinking about these mobile device uses in context of some data from IHS Markit. In its Q4 2016 wireless LAN and Wi-Fi phone market tracker report, IHS Markit found growing adoption of 802.11 ac Wave 2, which significantly boosts performance over earlier standards. Wave 2 wireless access point (WAP) shipments accounted for 10% of all units sold in Q3 2016, the firm reported. Still, Wave 2 has barriers to entry, the first being that every 802.11ac Wave 2 WAP needs multiple cable drops. And then consider the number of potential users, devices by user, and possible connections by all devices and by all users. Heads will spin just by the number crunching of the "potential" traffic generated by these users. For example, does the education vertical require Wave 2 and Wave 2 WAP across the board? Is it necessary in PreK-8 environments? If your answer is "Yes," then I suggest think again. If you're leaning toward Wave 2 because of standardization, is that necessary? But for grades 9-12 and higher ed, I'd say go for Wave 2 now rather than later. In considering the case, look at enrollment history of each school, for example. What are the enrollment numbers by grade level for the past five, 10 or 15 years? From these you should be able to determine the future number of students by grade level. Now you can factor in other things, including Internet of Things. And I would say enterprise users don't really need Wave 2 WAPs in any but the largest conference rooms -- say those with seating capacities exceeding 100 users. Rolling in Wave 2 as an all-or-nothing replacement doesn't really solve Wi-Fi problems, after all. That's akin to throwing more bandwidth at issues -- and that only masks the underlying problems at hand. Using Wave 2 to enhance existing Wi-Fi means you really need to do a heat map of your spaces and then look at how Wave 2 can improve what's in place. But keep in mind that bean counters are still going to demand that you justify the cost, as they do for anything IT. Be prepared to use facts and figures instead of "just because it's the newest technology." This translates to an old requirement: Know your traffic. Know what's going on in the WLAN, and map out deficiencies and how Wave 2 can benefit or solve the existing issues. Roll out directed hits at problem areas, and let the users sell the improvement. Word spreads pretty quickly in organizations when things go right... or wrong. Knowing who the users are and what devices are used along with what their data consumption patterns are will add value to IT.